Serious, official efforts to turn Norway into a cashless society have been put on ice, just in time for the country’s central bank to roll out its much-hyped new currency in updated syle. Norges Bank has been making it clear that Norwegian currency will remain legal tender, despite tax authorities’ and some politicians’ efforts to do away with it. The central bank was ready to debut the 100- and 200-kroner versions of its new series of bank notes on Tuesday afternoon. The series highlights Norway’s important maritime history and industry, with the Gokstad Viking ship adorning the NOK 100 notes and codfish featured on the NOK 200 notes. 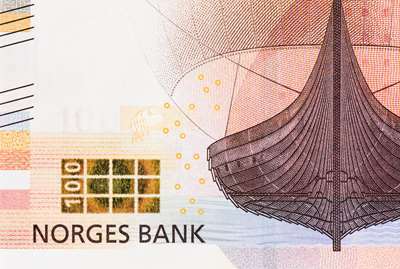 A lighthouse and a search and rescue vessel will adorn the new 50- and 500-kroner notes set to debut at the end of next year, while a wave will spill over the new NOK 1,000 currency that will be the last to roll out in the fall of 2019. Norway’s existing 100- and 200-kroner notes will still be accepted for the next year but will gradually be collected and phased out by May 30, 2018. They can continue to be traded in at Norges Bank, though, for another 10 years. The new cash is not only meant to reflect Norway’s maritime culture and business but also to improve security and prevent counterfeiting. The roll-out also defies efforts to discourage Norwegians from using cash and all but force them over to electronic banking. Commercial banks have been closing branches and even removing all cash from those left. Automated teller machines (called minibanks in Norway) have become harder to find and some retailers, restaurants, cafés, doctors’ offices and hospitals have also tried to do away with cash, forcing customers to use debit or credit cards or new mobile pay solutions. Tax authorities welcome any moves towards a cashless society, so that they can more easily track transactions, battle the black market in a variety of sectors (not least household services) and make Norway’s economy as transparent as possible. The Conservative Party, which leads the country’s current minority government coalition, went so far earlier this year to propose an official examination of a transition to a cashless society. The Conservatives wanted to make it legal for merchants and other businesses to refuse to accept cash, claiming that could secure and simplify transactions and hinder robbery. The banking and finance industry quickly embraced the Conservatives’ proposal, agreeing that phasing out cash would make transactions more efficient, secure and, most importantly, cheaper. The banking industry has been pleased that Norwegians already are keen to use their plastic cards, even for small amounts, since it wants to eliminate the sheer expense of handling cash. Concerns were also raised over the difficulty or inability of elderly citizens to adapt to electronic banking, when many still don’t use computers or smart phones. “Some also have problems remembering pin codes,” Dommerud wrote, or even seeing figures on small screens and understanding how mobile technology functions. A cashless society can lead to more digital discrimination, it was argued, while children growing up in a cashless society may also fail to learn the value of money if there’s literally none around to count and hold in their hands. The danger of cyber attacks and breakdowns in electronic banking, which have plagued many Norwegian banks and especially the country’s largest, DNB, remain perhaps the biggest concern and hindrance to a fully cashless society. After months of debate, a majority in Parliament emerged this spring against removing current requirements that demand acceptance of cash. Both the Conservative and Labour parties agreed to secure the right to use cash. The Center Party never wanted to do away with it, so that blocks Norway’s move to a cashless society, as least for now. It also means that cash will survive beyond the upcoming parliamentary election in September, no matter who wins and forms a government. 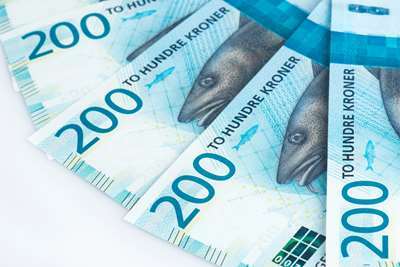 That helped clear the way for this week’s debut of new bank notes, which Norges Bank officials were celebrating on Tuesday in the scenic fishing hub and cod capital of Svolvær in Lofoten, on Norway’s northern coast. 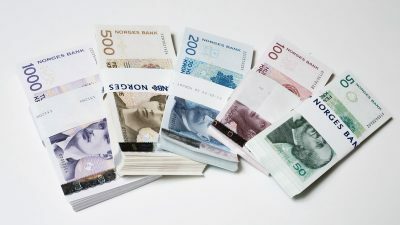 The central bank also prevailed in printing new versions of Norway’s largest bank notes, the 500- and 1,000-kroner bills that tax authorities would prefer be dumped.